Throughout April we are celebrating DIY Month and today Kathy’s got a handy project that will help to keep your craft supplies in check. 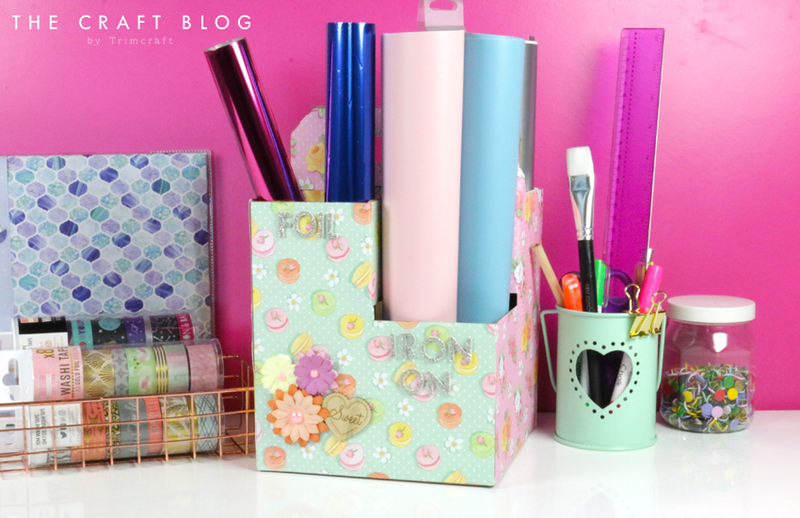 Tidy up your craft room with this DIY idea that will ensure that your supplies are kept close to hand and clutter-free. Today, Kathy is showing you how to transform a cardboard wine bottle holder (usually found free in the supermarket) into a stylish craft tidy that will help to keep you organised. 1. Take your collapsible empty cardboard wine box carrier. You can find these for free in most supermarkets. 2. Create a template for each section of your wine box by drawing around the box for each panel. Do this on plain paper first so that you don’t spoil your patterned paper by mistake. If you have several boxes, you could deconstruct one to ensure that you have the exact measurements. Remember to have the wrong side of the box facing up to draw your pattern onto the white side (or the wrong side of your patterned paper). 3. Choose four patterned papers and cut out all four sides of the box using your templates. Fix each panel to the box using your preferred adhesive. 4. Using your templates, cut two panels for the inside sections of the box that are visible and adhere them to the box. 5. Using your self-adhesive alphabet stickers, label your box with the craft items that you’re going to store inside. Embellish the box as you wish – we added paper flowers and a wooden heart from the Sweet Moments collection. Your make is now complete! You can now safely stow your supplies in your new craft tidy. We chose to stash our rolls of foil and iron-on in ours and what’s great is that our wine box has a carry handle – perfect for crafting on the go! What do you think of this upcycling idea? We’d love to know if you give this a try, so don’t forget to tag @kathycraftstv and to #Trimcraft when uploading to social media and to share you projects in the Inspiration area. What an amazing idea. I just love it, when I can re use something, that most people would throw out, and this is gorgeous and looks amazing and is sooo usefull for so many things. Stunning work here, well done. Thank you, and the best part is you have to buy wine to make it!